4. In the figure below if AB = 8, BD = 2, AC = 10, DE = 6. Calculate AE. 5. The mean of four numbers is 5 and the mean deviation is 3. Find the fourth number if the mean deviation of the first 3 number is 2. 7. Find the angle between the straight lines y=4x-7 and y =3x + 1. What is the value of (P+Q)? 9. A 2% error is made in measuring the radius of a sphere. Find the percentage error. 11. The sum of 10th terms of an AP is 30 and its 12th terms 36. Find the first terms and the common difference. 12. For what values of x is x + 3(2-x) ≥ 4-x ? 13. John writes 8 papers and failed 3 papers, Joel wrote 6 papers and failed 2 papers. If one of them is called and then a paper is selected, what is the probability that the failed paper is selected. 14. Find the compound interest on ₦450 in 3 years at 4% per annum. Correct to the nearest tenth number. 17. The sum of four numbers is 12145. What is the average expressed in based five? 18. Which of the following represent the shaded portion in the figure below? 19. 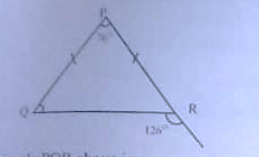 The triangle PQR above is ______.